The last few years seem almost like the renaissance of the Slider. No matter if it is a high-end New York eatery, or a local backroad greasy spoon, the small hamburger remains one of the most popular items on the American palette. When searching for the best slider a trip to Urbana Ohio’s Crabill’s, known as one of the best burger joints in America, is a must. This joint easily schleps one of the top Sliders in the business. The Best Hamburger in America? 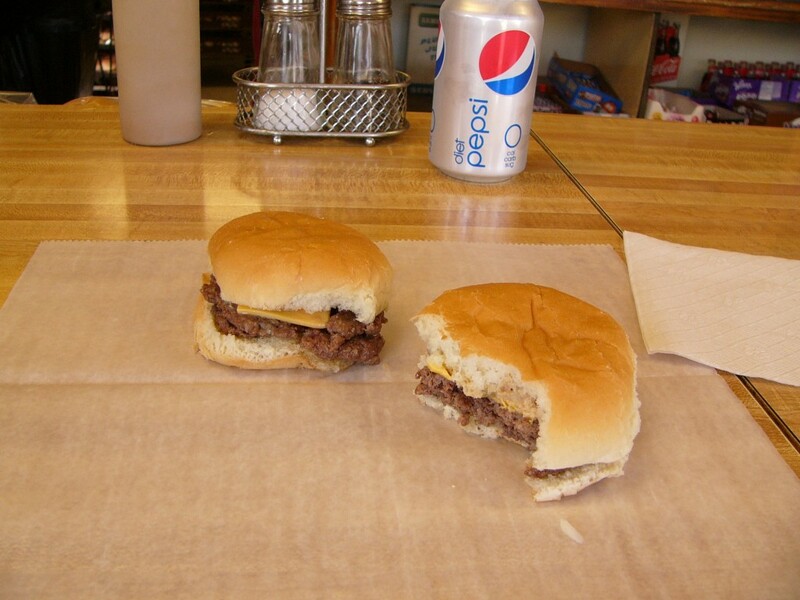 Comparing Crabill’s to a White Castle Slider is almost piling on the corporate chain. There is no comparison. Served with sweet relish and brown mustard (ketchup is frowned upon), the Crabill burger is a juicy delight. Two juicy Crabill’s hamburgers is simply not enough. Crabill’s menu is simple; a few other items are offered, but the Sliders remain the star after all these years. Sometime, I may try one of the hot dog varieties. 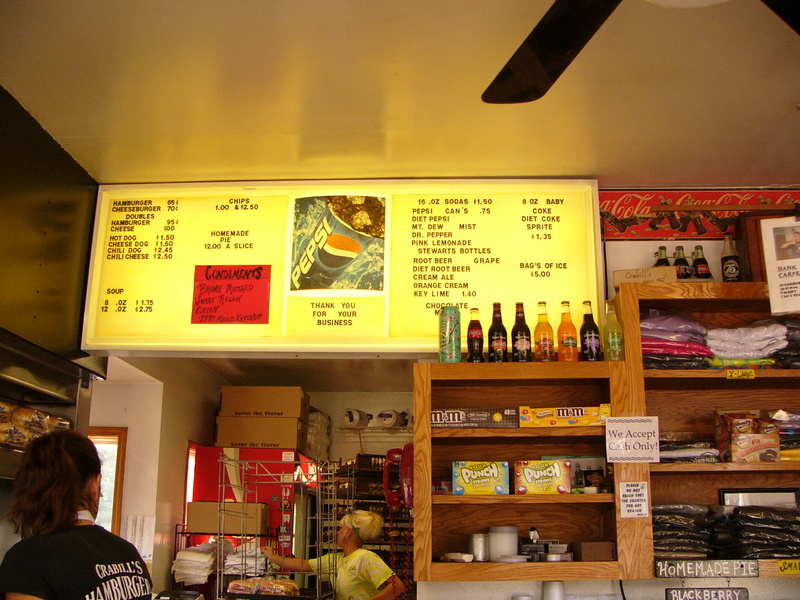 The simple menu at Crabill’s Hamburgers in Urbana, Ohio. The Crabill family has been making hamburgers in Urbana since 1927. The restaurant moved to its current location on US 36 on the west side of Urbana in 1989. Crabill’s Hamburgers is located on US 36 in Urbana, Ohio. The restaurant is small, featuring a close up grill, where the Slider-making can be watched in all its glory from a few bar stools arrayed at the front of the counter. Marsha Crabill works her magic on the grill. 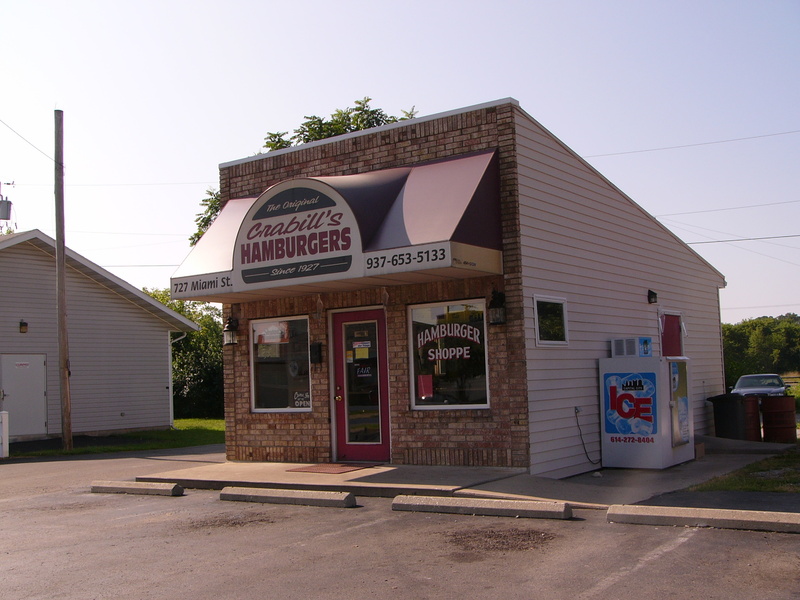 A visit to Crabill’s is highly recommended to any burger fan in the Midwest. Urbana isn’t far from the US Air Force Museum at Wright Patterson Air Force Base, Clifton Mill, Cedar Bog, or the hippie enclave at Yellow Springs. It’s a perfect lunch for a Western Ohio day trip. ← Who Cares About the iPhone 5? Where’s the 128GB iPod Touch, Apple? I have lived in Urbana all my life. When ever we have friends out of town or from out of the country we try and get them to Crabills to try the amazing food.